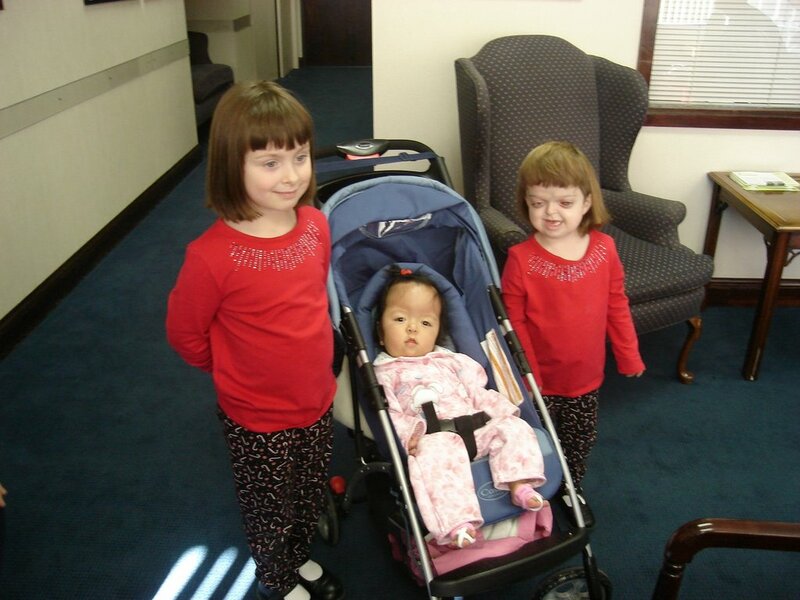 Here are some pictures of some of the people listed above, and also of some other families and kids with craniofacial syndromes like Angel. 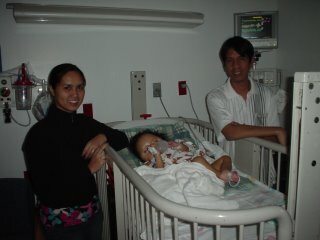 Today Angel was moved from ICU to the children's recovery floor. She has a swollen head which is totally normal for this surgery. Dr. Fearon says that things went very, very well! Angel's head will swell even more tomorrow, but then it will start to go down. It will be a week or two before the swelling shrinks significantly, and then another 4 weeks or so until all the swelling is gone. 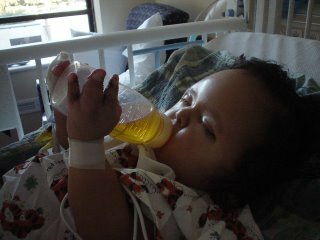 Angel was drinking apple juice and moaning and crying...all normal and all good signs that she's going to be just fine! Today was also the day for the Children's Craniofacial Association Holiday Party. 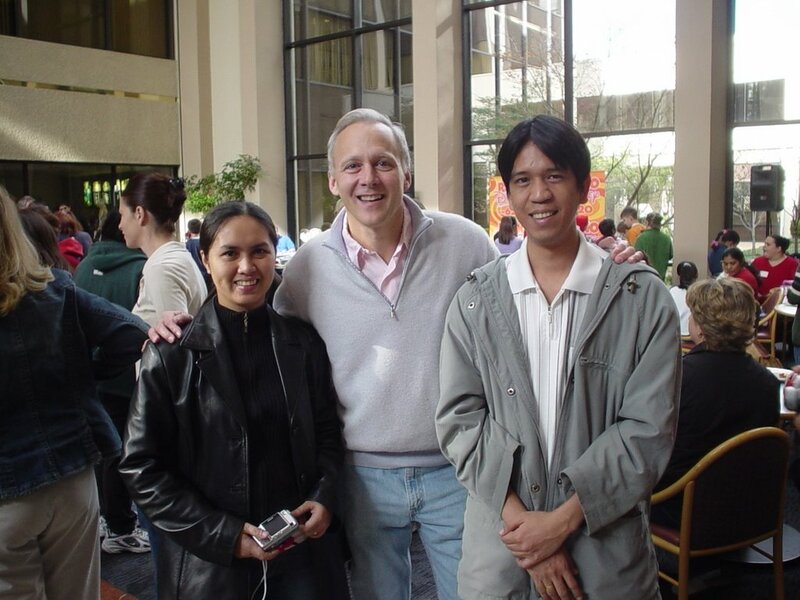 There were toys for kids given out by Santa, a Disney radio station playing music and games, lots of snacks and punch, and lots of crazy kids running all over the hospital lobby having a wonderful time with their friends. 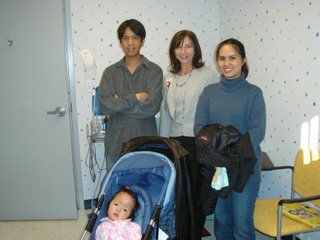 Eva and Pol were able to come down to see the party and meet some other Apert families while the nurses took care of Angel in ICU. 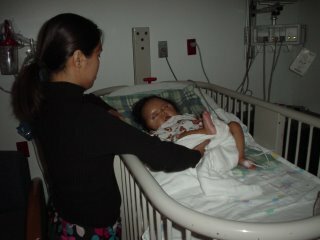 Pol wrote today to say that Angel's second surgery (the cranial vault remodeling) went very very well. Eva has been in the US for a few days and they are both at Angel's side tonight. Angel will have a period of swelling - a few days with severe head swelling, about a week of medium swelling, followed by a month or more of minor swelling. I go to Dallas tomorrow to see them, and hopefully Angel if she is out of the ICU and up on the children's recovery floor tomorrow afternoon. Thanks to all for contributions and prayers. This has all been a miracle for this family. I will post pictures as soon as I have them.